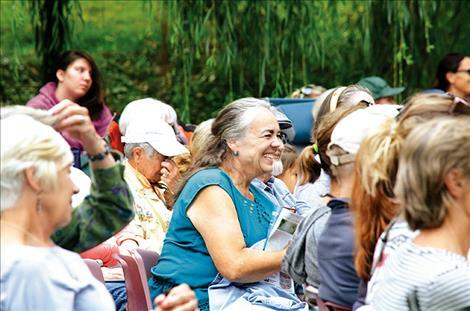 The audience enjoys the play. 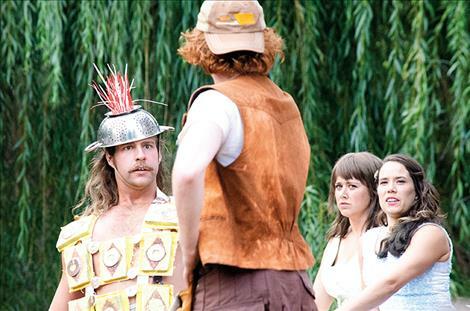 The character Don Adriano de Armado takes the stage in the Montana Shakespeare in the Parks production of “Love’s Labour’s Lost” in Charlo on Saturday. 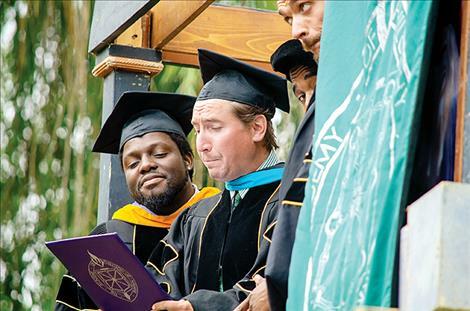 The scholars look at their contract that includes rules about avoiding contact with women for three years. One of the attendants to the princess is center stage. 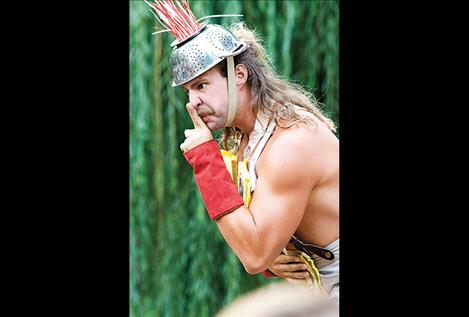 Don Adriano de Armado acts silly during the play. 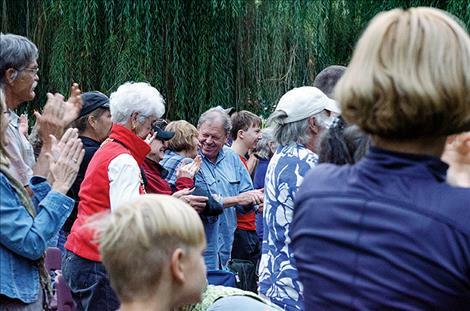 CHARLO – Focused on supporting art and culture in the Mission Valley, volunteers with the Ninepipe Arts Group held fundraisers and baked treats to bring art camps, scholarships and theater to the area. 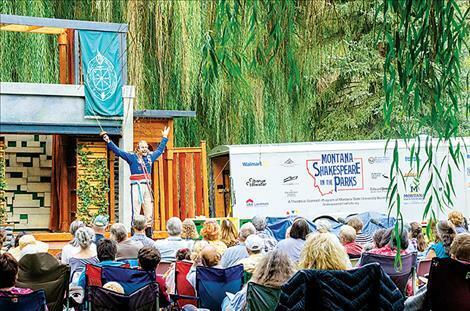 Last weekend, the group’s fundraising efforts came together to pay for a theatrical presentation by Montana Shakespeare in the Parks again this year. 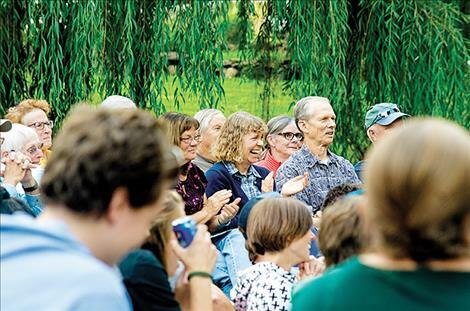 “I think this is the best turnout we’ve had,” volunteer Ben Ferencz said as he looked at a crowd of about 300 people gathered under the tall willows in Charlo on Saturday. Ferencz wasn’t sure what brought so many people to the event this year. He speculated that it might be the “perfect weather” as it wasn’t too hot or too cold during the evening performance. 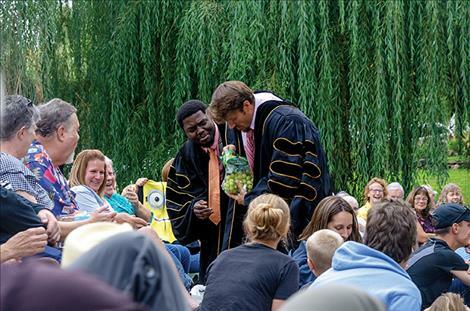 He said it might also be the beautiful setting for the play with the trees and groomed green grass. Earlier in the day, actors pulled up a truck with a gray trailer and set up a large two-story stage then donned 1950s clothing with ankle length dresses and suits. Filling the stage during the evening performance, actors shared lines developed by William Shakespeare more than 400 years ago in his comedy, “Love’s Labour’s Lost.” The play is about a group of friends who renounce the company of women for the pursuit of scholarly ambitions. 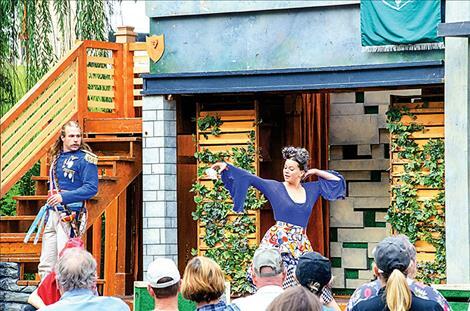 Shakespeare’s language is a bit different than the English used today with lines like “I am resolved; ‘tis but a three year’s fast,” but the crowd laughed and clapped and seemed to enjoy the production. 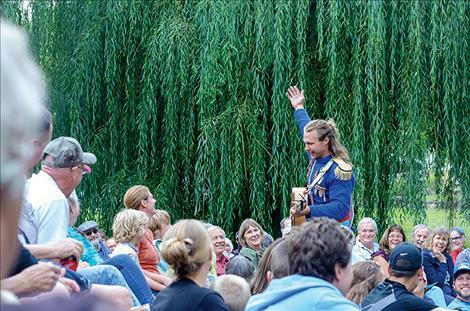 The Ninepipes Arts Group is fundraising for next year’s art camp for children and live theater performances. They can be found at www.ninepipeartsgroup.word.press.com or on Facebook.